With new Fast Charge technology, your battery can go from zero to up to 50% in about 30 minutes, reducing the amount of time being connected to an outlet. The Samsung Fast Charge Wall Charger plugs into any standard wall outlet via USB Cable, and its compact design means it is small enough to put in a briefcase or backpack when you’re on the go. Samsung’s charging technology powers your phone while it charges its battery, so you can make calls, check your messages or browse the Web while your phone is charging. This Samsung charger has a standard output of 2 Amp to give your phone power at a much faster rate than your typical 1 Amp or 700mAh charger. Additionally, it comes packed with Fast Charge technology that will charge Samsung devices with that feature built-in at an even faster rate! 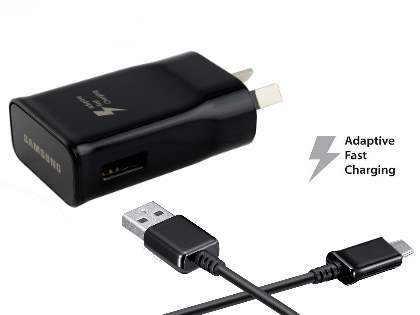 This genuine Samsung Galaxy mains charger comes in 2 separate parts (Charge and cable) which easily fit together for quick and convenient charging.